How excited are you about all of the great Mother's Day deals going on this weekend at the always fabulous Marley Lilly? It's hard to believe that Mother's Day is only a few weeks away -- that means the time to shop for gifts is now! One lucky Clemson Girl reader may already have her Mother's Day gift AND a gift for herself. 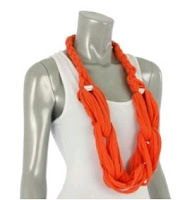 One lucky lady is winning two of the super adorable orange rope scarves from Marley Lilly. Congrats Bry! Please email us at clemsongirlblog@gmail.com to claim your prize! You have until Monday at 5pm EST to contact us or we will draw a new winner. If you didn't win today's giveaway, you can still score one of these super cute rope scarves from Marley Lilly. Spend $100 or more on MarleyLilly.com and get one of these scarves for FREE! Thanks to Marley Lilly for sponsoring today's giveaway. We hope everyone enjoys their weekend!